When I need directions in the car, I usually just ask Nigel* to pull up the driving directions for me. 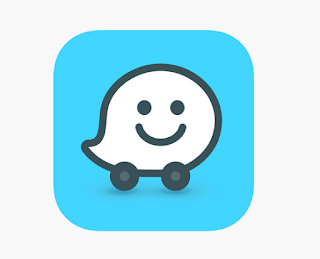 But I've been trying to use Waze more often because listening to it makes me so damn happy. I know that sounds weird. But did you know that you can record your own voice directions on Waze? (It's true! Learn how to here!) When my husband and I first learned that, our initial thought was . . . why would you want to hear yourself? But then we were stuck in traffic with all five kids in the car so we thought it might be entertaining for them to try it. 1. Even though it wasn't that long ago, some of their voices sound so much younger, tinier and more adorable. 2. My older son's various random accents, like saying, "Turn left" in his best Arnold Schwarzenegger. 3. Hearing the background voices on certain directions. They only come up once in awhile but they capture a moment of us all in the car, all talking . . . it's a weird little thing to treasure but I do. 4. Liberties taken with some of the voice prompts . . . like instead of just saying"rerouting," my daughter made a cute sing-songy "boop-de-boop" noise. "Hazard reported ahead" is "Dukes of Hazzard ahead." 5. I have heard all of the above things many times and love them each and every time. I thought I had heard them all, but on a recent trip using Waze, my 12-year-old son's voice imitating Brain--of "Pinky and the"--told me to "Take the third left . . . you imbecile!" *I have switched my Siri's voice to be a British man's voice and I call him Nigel. When I ask him what my name is, he says Darling. It's the little things.